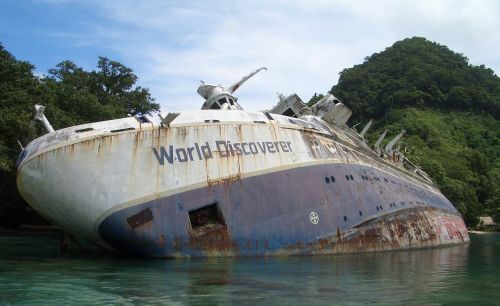 Abandoned World Discoverer Ship in Roderick Bay, Nggela Islands, Solomon Islands, Oceania. Built in 1974, it was a cruise ship that periodically would go to the polar regions and allow passengers to watch ice floe movements and glaciers. Built with a double hull construction it was capable of handling minor impacts with ice. 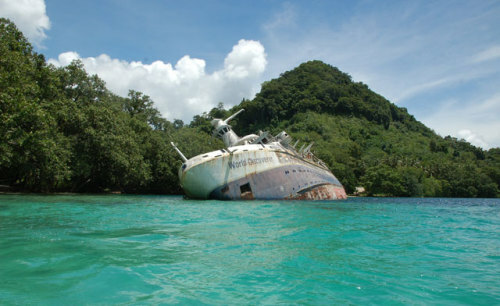 On April 30, 2000 the ship struck a large uncharted rock or reef in the Sandfly Passage of the Solomon Islands. After the passengers were safely taken to shore via passenger ferry the captain then steered it into Roderick Bay while the ship began to list (tilt) and grounded it to avoid sinking. So long ago…. We’re you there?